The Hummingbird Acoustic Guitar has a reputation that is second to none when it comes to great acoustic guitars, especially those guitars built on a dreadnought body. One look at the hummingbirds etched onto the pickguard of this model makes one nostalgic for the folk music and freedom of expression that the 1960’s were best known for, and one that has become a real American cultural icon. Introduced in 1960, the Gibson Hummingbird quickly became the guitar of choice for blues, country and bluegrass players thanks to the Hummingbird’s rich, woody tone and its easy playability. The Epiphone Hummingbird Acoustic Guitar is a more affordable version of this Gibson classic, and will play its part in keeping the iconic tradition of the Hummingbird alive for decades to come. Built with a solid spruce top for a vibrantly rich tone and excellent projection, the Epiphone Hummingbird has the same woods as the Gibson model, including the mahogany back and sides; a fact which contributes to both guitars having the warm, woody tone that makes it so well loved by so many. When it comes right down to it, however, while the Epiphone Hummingbird stands up well to all styles of playing, the Gibson Hummingbird just has more punch. In fact, while the Epiphone is an excellent guitar, the Gibson model simply has more of everything; more depth of tone, more volume, and better projection. This is largely attributable to the fact that the overall quality of woods used for Gibson guitars is superior to the Epiphone models. Specifically, the Gibson Hummingbird model is built using all-solid woods, while the Epiphone Hummingbird back and sides are built using laminate construction. Furthermore, the Gibson model is finished in nitrocellulose lacquer and the Epiphone in polyurethane. The downside is that the Gibson Hummingbird also costs more; decidedly more. 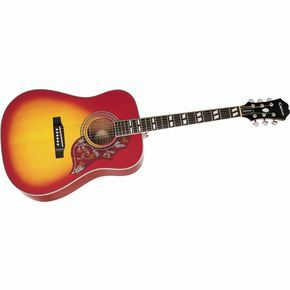 At $3,899 the Gibson Hummingbird is a bit out of most guitarists financial reach, which makes the Epiphone Hummingbird (priced between $299-$349) an incredibly attractive alternative. While the dreadnought body of the Epiphone Hummingbird may make it a bit large for some players to handle, it stands up well to all styles of playing. Between the Epiphone Hummingbird’s smooth action, eye-catching sunburst design and it’s surprisingly affordable price, it will have you falling in love with your own American cultural icon. Education department should give free education to the poor girls of the society. The poor girls of best dissertation writing service uk the society can become successful and developed with the help of the rich families and the education department. I drive truck and wanted a guitar to pass down periods with. I have a 73 TAK. 12 string at home that needs some slc and is too big for my space. Off to GC I go thinking another tak. I had a budget and wanted quality. Story short, I played quite a few bit nothing jumped at me. Then I found the epi sunburn Hummingbird. Looked and played great plus I could smell the wood. I fell in love. I'm still refining the set up but I really enjoy this guitar. Many want a lot of features in production instruments on the low end. I fell I have that right now. I play for my enjoyment and well being. Something magical happens after a long day working, to just relax a play and enjoy. Hope you find what I have and most of all enjoy and have funnnnnn! Danny - To answer your question, the Epiphone Hummingbird's mahogany back and sides are laminate not solid wood. You would need to spend several more hundred dollars to get a solid-wood guitar. And, the tuners are Grover tuners. I just bought it used today. Did a little work to it ... new strings and polished it up and it really plays great. Low action, no buzzing a little more higher pitched than my others but I think its going to be a really nice guitar. I just wish I could get some really good info on it, like are the sides and back laminated or actual wood. I know the top is solid spruce. Also do they come with the plastic Les Paul type tuners, because all the ones I've seen have Grovers. Join in and write your own page! It's easy to do. How? Simply click here to return to Epiphone Acoustic Guitar.